Could CES hold a Medfield-powered Red Ridge tablet by Intel? Intel is suddenly becoming very interesting. First, word got around that the chip maker might have two tablet processors to show off at CES 2013 - the Bay Trail-T and a SoC called the Valleyview-T. The chips are said to bring quad-core power, long battery lives and a whole lot of improvements that could give Qualcomm's S4 a taste of its dust. Now we're seeing a filing from the U.S. Federal Communications Commission (FCC) containing a tiny label with a load of info. 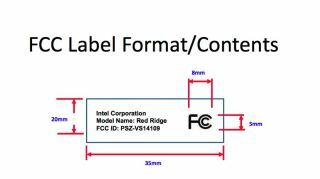 The 20 millimeter by 35 millimeter tag is plastered (figuratively) on a device based on Intel's Red Ridge tablet platform. Red Ridge, you might remember, is based on the company's Medfield processor. Relatively little has been spoken about Medfield in recent months, and what's been said isn't entirely positive. Intel successfully ported Android 4.1: Jelly Bean to Medfield in September, meaning devices like the Orange San Diego and ZTE Grand X IN could get a sugar bump up from Android 4.0: Ice Cream Sandwich, though that was an internal development with no commercial roll out. What also came to light back then was that the chip couldn't support LTE in phones, kind of a "wa-wa" in today's mobile world. However, Intel also said that it was planning to ship LTE products in late 2012, with deployment ramping up next year. Medfield might even push out a dual-core version to rival quad-core competitors. Could Medfield start the year off with a triumphant debut...possibly at a major event like, say, CES? The labeled device the FCC tested ran ICS and housed both Bluetooth and NFC capability. It also picked up 802.11a/b/g/n Wi-Fi. The filing also reveals something tantalizing: the device tested was apparently a production model, meaning a commercial unit could be ready in the next four weeks. That puts the timing squarely in CES territory. While we're not the gambling type, it sounds like a pretty sure bet Intel could have a Red Ridge-ready, Medfield-packing tablet to show off in Vegas next month.